That brings today's proceedings in the Siambr to a close. AMs approve the Local Authorities (Capital Finance and Accounting)(Wales) (Amendment) (EU Exit) Regulations 2019. This amends the definition of “money market fund” to omit a reference to European Directive2009/65/EC. AMs pass the Welsh Tax Acts (Miscellaneous Amendments) (EU Exit) Regulations 2019. 5. make further technical and minor amendments to the TCM Act resulting from EU Exit. AMs pass the Plant Health (Forestry) (Miscellaneous Amendments) (Wales) (EU Exit) Regulations 2019. The Plant Health Directive contains measures to be taken in order to prevent the introduction into, and spread within, the EU of serious pests and diseases of plants and plant produce. Plant Health (Fees) (Forestry) (Wales) Regulations 2019. AMs pass the Seed Potatoes (Wales) (Amendment) (EU Exit) Regulations 2019. Those Regulations control the production with a view to marketing, the certification and the marketing of seed potatoes in Wales, other than those intended for export outside the European Union. AMs pass the Rural Affairs (Miscellaneous Amendments) (Wales) (EU Exit) Regulations 2019. These Regulations make amendments to subordinate legislation, which applies in relation to Wales, relevant to cattle identification; the trade in animals and related products; examination for residues and the maximum residue limits in respect of animals and animal products; transmissible spongiform encephalopathies; seed marketing and plant health. AMs approve the Food (Miscellaneous Amendments) (Wales) (EU Exit) (No. 2) Regulations 2019. According to the Report of the Constitutional and Legislative Affairs Committee, "most of the provisions make minor technical changes to ensure that the Welsh regulations, which provide for the implementation of retained EU law relating to food and feed hygiene and safety, food compositional standards and labelling and food and feed regulated products, will continue to be operable and enforceable in Wales after the UK leaves the EU. "However, the amendments to the Natural Mineral Water, Spring Water and Bottled Drinking Water (Wales) Regulations 2015 also provide that from exit day, waters from the EU/EEA, like waters from other third countries, must be recognised as natural mineral water in Wales/the UK before they may be placed on the market in Wales." AMs pass the Food (Miscellaneous Amendments) (Wales) (EU Exit) Regulations 2019. They amend subordinate legislation, that applies in relation to Wales, in the field of food marketing, labelling, classification and other related measures. AMs approve the Regulation and Inspection of Social Care (Qualifications) (Wales) (Amendment) (EU Exit) Regulations 2019. These Regulations make amendments to the Regulation and Inspection of Social Care (Wales) Act 2016 (the 2016 Act) relating to the regulation of social workers and social care managers in Wales. Amendments are also made to the 2016 Act relating to exclusions to the scope of regulated advocacy services, to amend references to European Lawyers, and to the Mental Health Act 1983. AMs pass the Regulated Services (Service Providers and Responsible Individuals) (Wales) (Amendment) Regulations 2019. The 2017 Regulations set out the regulatory requirements which apply to providers of certain services regulated under the Regulation and Inspection of Social Care (Wales) Act 2016 (the 2016 Act). These are care home services, secure accommodation services, residential family centre services and domiciliary support services. Regulation 4 makes a number of amendments to regulation 2 of the 2017 Regulations dealing with circumstances when a person is exempted from the requirement to register as the provider of a care home service. Regulation 5 amends regulation 3 of the 2017 Regulations to stipulate that nursing care provided by a registered nurse does not come within the scope of activity of a domiciliary support service. Regulation 8 adds a requirement to regulation 28 of the 2017 Regulations concerning a service provider’s policy and procedures for children’s savings. AMs pass the Regulation and Inspection of Social Care (Wales) Act 2016 (Consequential Amendments) Regulations 2019. Under section 178(4) and (5) of the Social Services and Well-being (Wales) Act 2014, the Welsh Ministers are required to make regulations to make further provision about a local authority’s duty to make arrangements to help children and young persons who want to make representations. This applies to representations by children and young persons about a range of the local authority’s social services functions which affect children and young persons. These Regulations make provision about the categories of persons who, under the local authority’s arrangements, may not provide assistance to the child or young person. AMs pass the Regulated Adoption Services (Service Providers and Responsible Individuals) (Wales) Regulations 2019. These Regulations are made under the Regulation and Inspection of Social Care (Wales) Act 2016 (“the Act”) and set out the regulatory requirements and related provisions for providers of regulated adoption services and for those persons who are designated as the “responsible individuals” for such services. AMs are now discussing a series of regulations arising from the withdrawal of the United Kingdom from the European Union. Independent AM Mandy Jones, speaking against a smacking ban, says "I was adopted as a baby, and throughout my childhood and as a young adult I was both physically and emotionally abused by my adoptive mother". She says she had "nightly beatings". She adds, "I know there is a night and day difference between abuse and a smack". 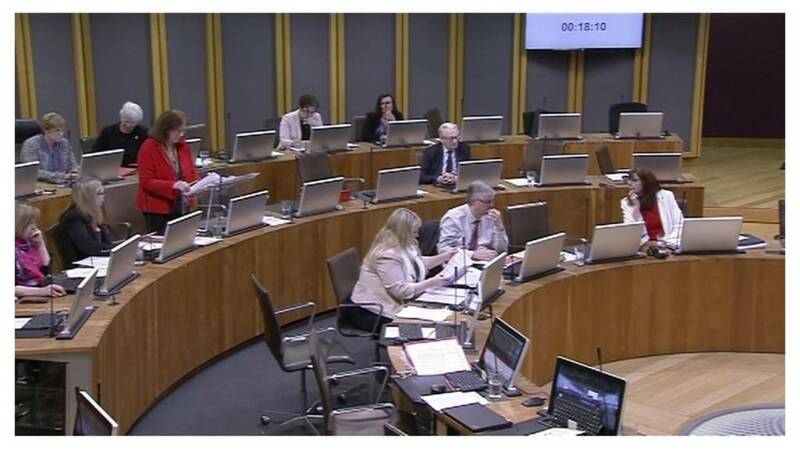 "I can think of no more fit person on her benches to be the Member in charge of this piece of legislation," says Plaid Cymru's Helen Mary Jones about Labour AM Julie Morgan who had campaigned for the change in the law before her party agreed to pass new legislation. UKIP's Gareth Bennett asks, "What safeguards will there be against needless prosecutions? There are potential problems of the police, the CPS ([Crown Prosecution Service] and social services dealing with a large increase in complaints". Plaid Cymru's Sian Gwenllian welcomes the introduction of the bill, which she says has been Plaid Cymru policy for many years. She says it's "absurd" that children do not have the same protection from physical punishment as adults. Conservative Janet Finch-Saunders raises the concerns of campaigners that the law would criminalise ordinary parents. "How are we going to police our homes, are you not worried that this might drive families apart?," she asks. Deputy Minister for Health and Social Services Julie Morgan says passing the bill would "send a clear message that the physical punishment of children is not acceptable in Wales". She says the bill builds on its commitment to children's rights under the United Nations Convention on the Rights of the Child. Of 1,738 people and organisations who responded, 50.3% thought it would protect children's rights but 48.1% thought it would not. The only statement of the day is by the Deputy Minister for Health and Social Services Julie Morgan: The Children (Abolition of Defence of Reasonable Punishment) (Wales) Bill. A ban on smacking children is a step closer after the Welsh Government published the bill removing "reasonable punishment" as a defence.